Are you about to take a mechanical aptitude test? Find out how JobTestPrep can help you prepare with detailed information about all the mechanical aptitude tests used in the assessment industry. Acquire our mechanical aptitude test study guide, practice resources, and tailored preparation packages. With our assistance, you will gain specific mechanical knowledge and comprehensive score reports to land you the career of your dreams! The mechanical reasoning aptitude test measures candidates’ capabilities in applying specific mechanical or engineering knowledge and principles to identify the correct answer. This test is conducted during the recruitment process, usually along with other aptitude tests, for engineering or technical job positions. Related careers include mechanics, engineers, maintenance personnel, skilled tradespersons (i.e., carpenters and electricians), transportation operators, and even military personnel. There are numerous industries in the field of mechanics, so the content of mechanical aptitude tests may vary accordingly. How Do Mechanical Reasoning Tests Work? Mechanical reasoning tests are performed so that employers can evaluate your ability in working with mechanical concepts. Your results will be compared to that of other candidates and an average score will be calculated to assess the highest scores. Mechanical comprehension tests typically use multiple choice questions which relate to an included diagram. The test may be computer-based or performed as a written test. These aptitude tests do not assess your professional knowledge, rather, they measure your understanding and intuition regarding a variety of subjects. Mechanics: Energy (transformation, work & power, kinetic & potential energy), forces & motion (friction, acceleration, gravity, pressure), and levers, pulleys, screws, spring, etc. Electricity: Voltage, resistance, current, capacitors, charge, circuits (parallel, series), magnetism, and circuit diagrams, etc. *Portions of this section may also appear on electrical aptitude tests. Click here to learn more about this kind of test. This test is challenging since it is usually timed and involves a variety of questions which become more difficult over time. You may ask, what is the main factor that makes mechanical reasoning tests so daunting? The answer; they are designed to be practice-proof. Mechanical reasoning tests may include virtually infinite variations of questions, and the probability that the test presents a question that you have already encountered before is very slim. So, Is There Nothing I Can Do to Improve My Chances? Don’t despair just yet! Practicing is never futile. The special design of mechanical reasoning tests just means that practice should be different. Unlike numerical reasoning tests, for instance, where the most important thing is to practice, practice, practice, in mechanical reasoning tests the most important thing is to learn mechanical principles. Mechanical reasoning tests assess your ability to understand basic mechanical, physical and electrical concepts, and apply them to new, never-seen-before situations. If the runner hits the hurdle and stops, he will be decelerating. 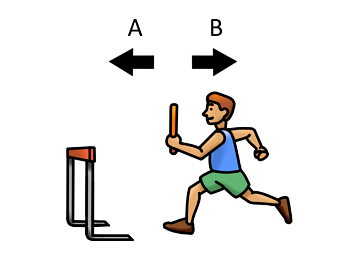 Therefore, the baton will accelerate in the opposite direction, meaning forwards. That happens when an object is located in an accelerating system, in the same way, you feel yourself pulled backwards when the car is speeding up or forwards when it is braking. The physical principle behind the question is this: When an object is located within an accelerating system (another object that accelerates or decelerates), the force on the inner object will be in the direction opposite to the system’s acceleration. At first glance, it seems that this is a question the like of which we've never seen before. 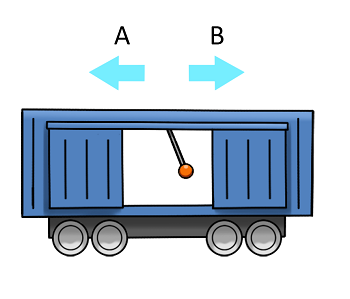 However, remembering the physical principle explained in the question above, it is easy to deduce that the inner object (the pendulum) is accelerating in the opposite direction to the system (the wagon). That means that the wagon must be accelerating in direction A. In this example, we've seen how it is possible to solve a never-seen-before question based on principles rather than experience and memorizing. In addition, applicants for more advanced (journey-level) positions may be requested to take a third type of mechanical comprehension test, the vocational knowledge mechanical test. That type of test is not discussed in this article, and you can find some useful information about it here. (link to an additional article). This type of test includes mainly theoretical questions which are usually irrelevant for everyday situations (levers, pulleys, gears electric circuits and fluids are some of the common subjects). Examples for tests: Bennett, Wiesen. This type of test includes mainly practical questions that are relevant and related to everyday situations (working tools, home appliances and fire and electricity safety are some of the common subjects). Examples for tests: Ramsay Mechanical Aptitude Test (MAT). 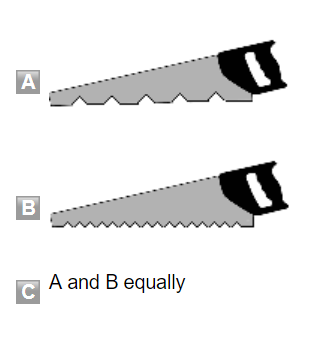 Which saw is more suitable for fine cutting? 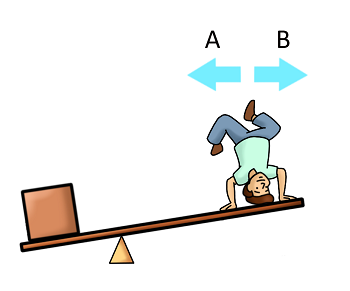 Note that some tests may incorporate questions of both realms. There are some special characteristics that are very common in mechanical reasoning tests. The questions are often intentionally vaguely phrased. The questions are mostly qualitative rather than quantitative in nature. Often, the questions will include an image. As the questions themselves, the images are often intentionally vague. The principle-based test design requires a practice that covers most subjects and physical principles in the limited time at your disposal. 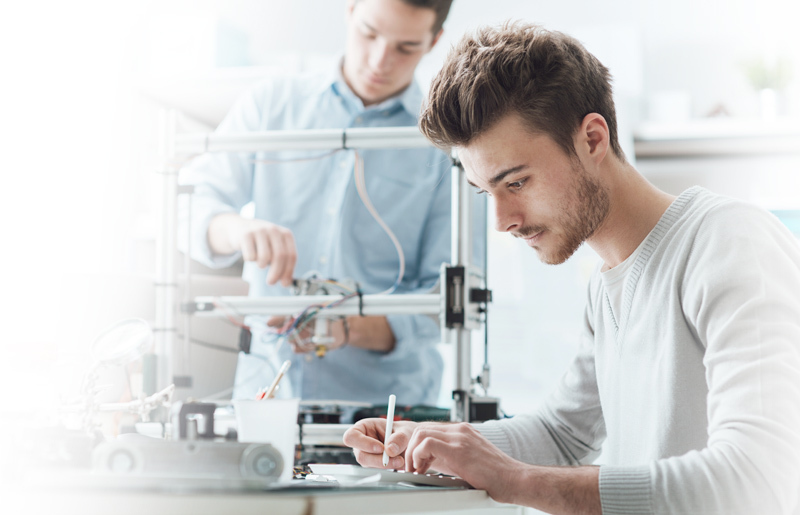 Some subjects on mechanical reasoning tests are more common than others, so study and practice must be prioritized accordingly. Who Uses the Mechanical Aptitude Tests? Below is a table of the most popular companies and organizations that utilize mechanical aptitude tests. Outscore the competition with JobTestPrep's PrepPack™ and ensure your success today. Being as mechanical reasoning tests assess your applied knowledge, practicing for the different kinds of questions is essential. Carefully read through the instructions before answering questions. Consider which mechanical techniques should be applied to a given problem. Refer to what you have learnt from your own practical experience. Check your answers to make sure that your calculation is correct. Use our practice tests to understand how to solve the mechanical reasoning test questions and familiarize yourself with the real test’s format. How Do I Practice to Succeed? Jobtestprep's PrepPacks are specially designed to help you with mechanical reasoning test answers. Including both full-length simulations of the test and multiple additional exercises to strengthen your understanding of mechanical reasoning questions and electrical concepts. We even offer a free mechanical aptitude test to give you a glimpse of the practice tests that we provide. All of Jobtestprep's study materials were developed to address the special characteristics and difficulties common to mechanical reasoning tests.